A power inverter, or inverter, is an electrical power converter that changes direct current (DC) to alternating current (AC); the converted AC can be at any required voltage and frequency with the use of appropriate transformers, switching, and control circuits. Solid-state inverters have no moving parts and are used in a wide range of applications, from small switching power supplies in computers, to large electric utility high-voltage direct current applications that transport bulk power. Inverters are commonly used to supply AC power from DC sources such as solar panels or batteries. The inverter performs the opposite function of a rectifier. The electrical inverter is a high-power electronic oscillator. It is so named because early mechanical AC to DC converters were made to work in reverse, and thus were “inverted”, to convert DC to AC. 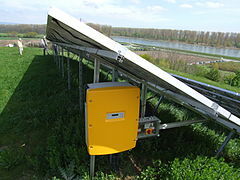 A solar inverter, or PV inverter, converts the variable direct current (DC) output of a photovoltaic (PV) solar panel into a utility frequency alternating current (AC). Inverters can be fed into a commercial electrical grid or used by a local, off-grid electrical network. It is a critical component in a photovoltaic system, allowing the use of ordinary commercial appliances. Solar inverters have special functions adapted for use with photovoltaic arrays, including maximum power point tracking and anti-islanding protection. Central inverters convert the DC voltage from “strings” of photovoltaic (PV) panels to AC voltage. They are residential, commercial and utility scale systems with power level of 1kW or higher. 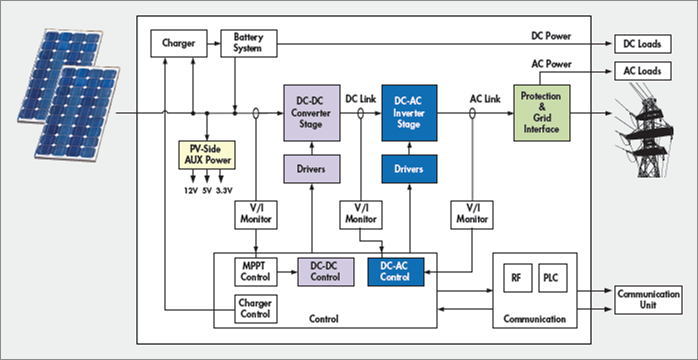 The maximum power point tracking (MPPT) for the PV panels is performed centrally at the DC-AC inverter stage. Battery backup inverters, are special inverters which are designed to draw energy from a battery, manage the battery charge via an onboard charger, and export excess energy to the utility grid. These inverters are capable of supplying AC energy to selected loads during a utility outage, and are required to have anti-islanding protection.